Hey guys. I posted before about a turbo upgrade and was told its kind of pointless etc.. I bought a standard cj lancer for the fuel effiency and for a safe car for my new born to get around in and that. 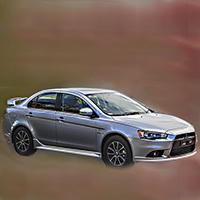 But now that my misses has finally got her license was just wondering if there is any way to help the cvt transmission with the slow take off and all that it just lags to much and im finding the drive in my lancer is just becoming unejoyable.. any suggestions please.. want to upgrade it to be a bit quicker and im really growing tired of the high and long revs just to take off. 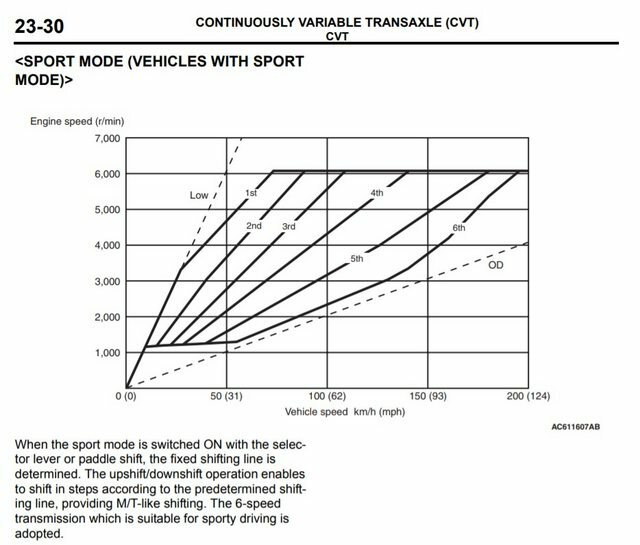 Yes the CVT is made to a price point that is aimed at economy/fuel consumption and comfort rather than performance. Nothing you do to the engine will change that as the engine isn't in control, the transmission is (it tells the engine what RPM to run). You could add paddle shifters (plug and play) or use the floor lever and drive as a pseudo manual with fixed ratios, but it will still struggle 'off the line' as the 1st gear ratio and final drive are quite short. Interestingly enough the Eclipse Cross has an 8 fixed ratio CVT so the standard smooth operation seems to have been ditched by Mitsubishi (and others). 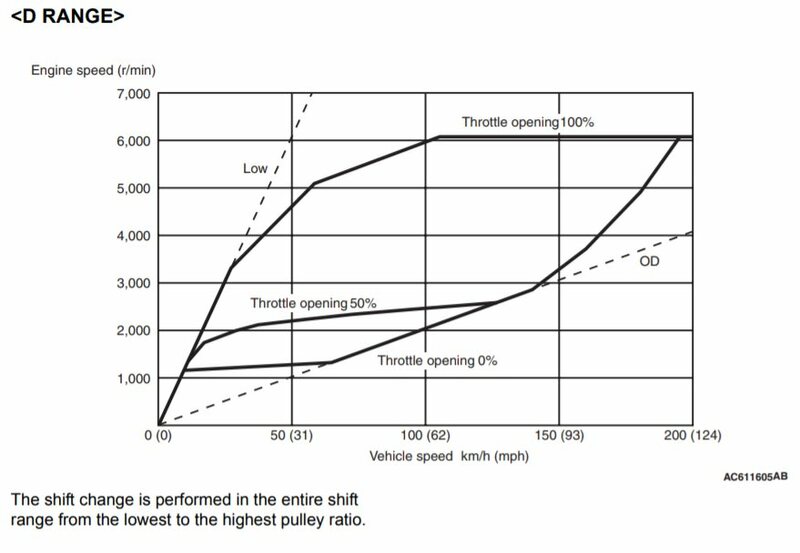 Note how in the following graphs that 1st gear isn't linear, even in sports mode. But at the end of the day you have to accept that you bought an economy car fitted with CVT, and if that isn't something you can live with best advice is to trade it in even though CVT is becoming more commonplace over traditional autos (or manuals). You will find that slow hesitancy at launch, isn't the CVT but just the inlet snorkel, its too restrictive! a 2.25 or 2.5inch muffler or cat back. Then enjoy!!! Certainly no RA or EVO but!!!!! HMMMM softer, quieter! more relaxed ride??? Alternative use the alternative and go through the gears, manually? Last edited by Lancer1993 on Thu Mar 22, 2018 6:41 pm, edited 1 time in total. Hahah I’m wishing I did! 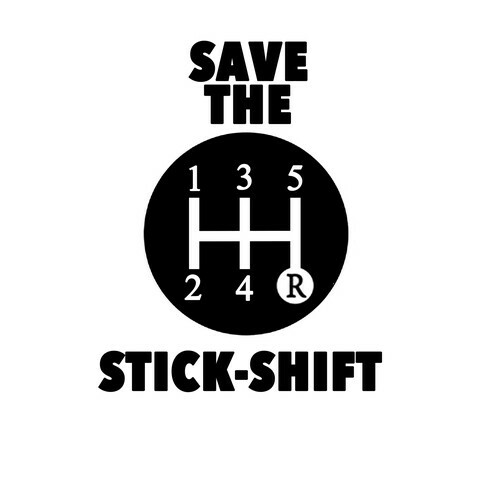 With that stick shift arrangement I'd be forever trying to put it in 6 and hitting reverse, used to do it all the time after going from 6 to a car with 5. Makes a horrible sound and no doubt causes damage. That said I've joined the dark side and now much prefer auto over manual, particularly with paddle shift, as slow traffic, hills or traffic lights are no longer an issue and have me worrying about clutch wear or missed/grinding gears + bunny hopping etc (all skill issues I know). Plus with an auto you can change 'gears' mid corner and not have the worry of coordinating arms and legs and just concentrate on taking the turn, and with hills if you get it wrong there is no risk of 'bogging down' when you have to down shift all in all fool proof. Auto gearboxes (sequential) can be fun and fast, just look at any major motorsport (Supercars, World Rally etc.). But as they say horses for courses and our aims and goals when driving will differ so no solution is right. 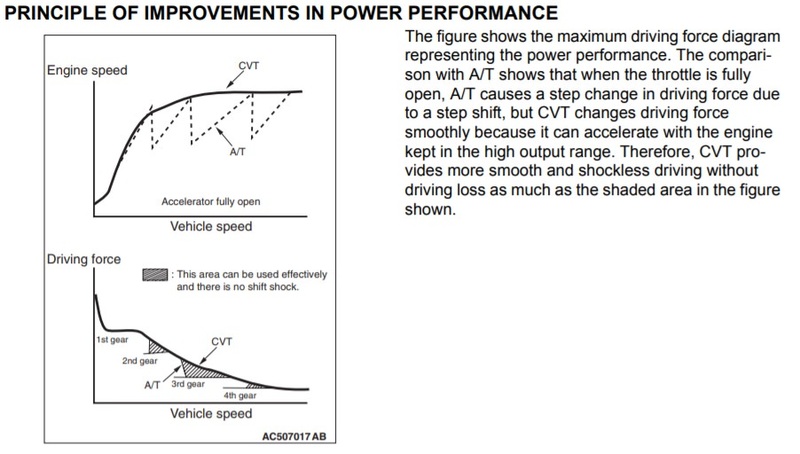 Basically US CVT had a software glitch that made it hesitate on take off. Wonder if it is also in Aus cars. The main issue it's ratio is very high down low. My car does 90km/h when in 1st. It is was around 50 it would take off really fast. The constant speed of the engine and transmission whine is something our ears are not use to so we naturally feel it's wrong.